If you and your fellow founders have chosen to implement the Slicing Pie model in your bootstrapped startup company, you can rest assured that if you follow the logic you will all get a share of the equity that accurately represents the fair market value of your contributions relative to other participants. Furthermore, you and the other members of the team will enjoy the security the model provides when someone separates from the firm. No matter what transpires, Slicing Pie will self-adjust the split to keep it perfectly fair. 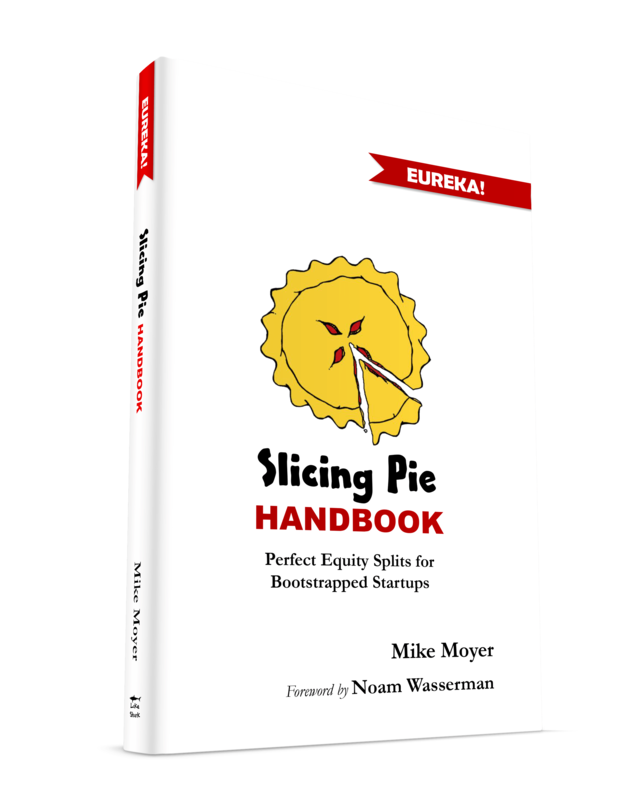 I spend a great deal of my time teaching Slicing Pie model to people all over the world through live seminars, phone calls, emails and webinars or creating educational materials including books, videos, articles, and even a Slicing Pie game. Still, sometimes it just doesn’t “click” right away. Be patient and give the person some time and space to fully understand how it works. People who agree to it without understanding it could get caught off guard. For instance, a person who gets fired for cause will lose some or all of his or her slices. It’s perfectly fair, but it may still hurt (as it should). Slicing Pie gives people what they deserve, not always what they want. Occasionally, you will encounter a person who dismisses Slicing Pie for no reason other than he or she not wanting to take the time to learn it. Often, these people cite industry “norms” like, “an advisor should get 2%,” or “it was my idea, so I want 51%.” The person might be “old school” and consider themselves “above” the model. I often hear things like, “let’s just trust each other,” or “we’ll just do what is fair.” These statements show a lack of understanding of how Slicing Pie and the assumption that it is possible to somehow “know better” and magically pick the right split. Encourage these people to take another look at the model but be willing to walk away from them if you must. Don’t compromise and give them a fixed percentage. Trust me, it’s not worth it. No matter how great they may be, someone is going to get burned. This reason is a bit more complicated and is usually a major red flag. Someone who appears to understand the model yet insists on a fixed percentage is either willing to benefit at someone else’s expense, or willing to allow someone else to benefit at his or her expense. If someone feels he or she is in a position of power, the temptation to take advantage can be significant. If the company is desperate for cash, for instance, the provider of the cash may impose unfavorable terms. Don’t sell chunks of equity for small amounts of cash. Use loans or convertible notes. Premature valuations can cause all kinds of problems for startups and can set a bad precedent for future participants. Someone in a power position may not be aware of the damage that a bad financing deal can cause and may feel quite justified in their position. Walk away. If your company is worth investing in, you will be able to find other investors. If the person asks for a fixed chunk of equity that appears to be less favorable than what the Slicing Pie model might allocate you have a different problem. You may be dealing with someone who does not take the project seriously or worse, the person may expect it to fail so who cares how much equity is allocated? Don’t put a person on the team who does not share your own confidence in the vision of the company. The best-case scenario is you will have to fire the person for cause which is pretty stressful and time-consuming. Slicing Pie always works. It always creates a fair split. Do your company a favor and walk away from team members who don’t understand fairness or don’t value the benefits of being fair.